I'd seen a few of these vest type cards on my internet travels and thought it would be a great idea for my Father-In-Law. 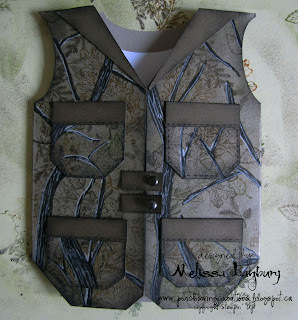 When I showed an example to my husband he said 'ya that would work but a camo vest would be so much better'...ugh I thought; how am I going to re-create camouflage?? So I pulled out one of my son's jackets as inspiration and went to work. Follow along and I'll show you how. 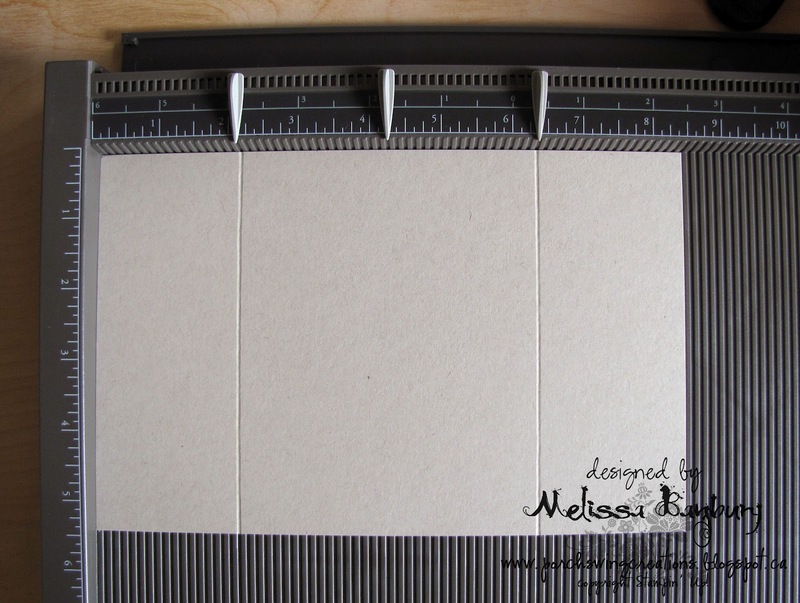 Cut a sheet of Crumb Cake cardstock to 5 1/2" x 8 1/2". 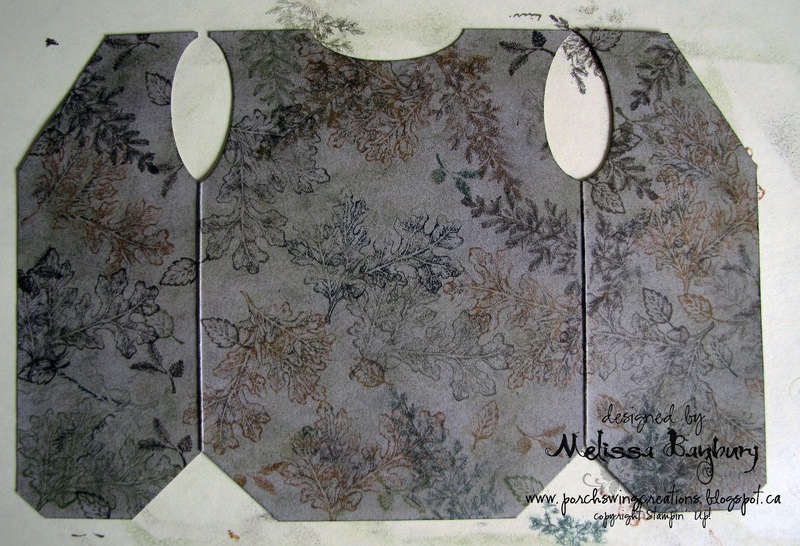 Score on the landscape side at 2 1/8" and 6 3/8" and fold inward. 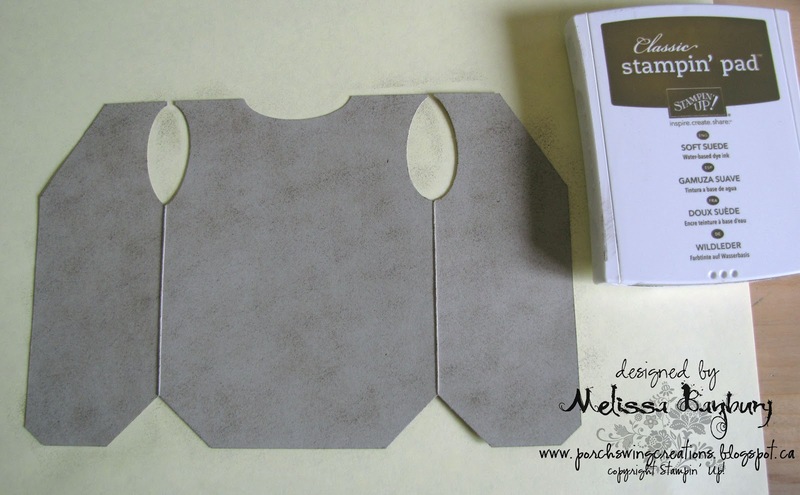 While card is folded closed measure 3/4" in along the bottom from the fold line as well as vertically on the fold line and make a light pencil mark. Do this on the bottom of both sides of the card. 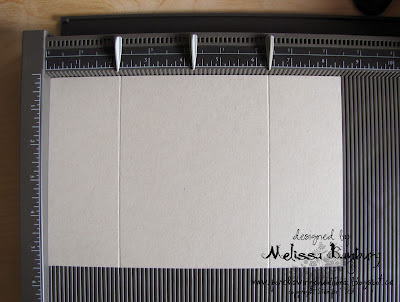 Using a square punch or paper cutter, line up mark lines and punch through both layers of paper. Do this on both sides. Turn the card to work on the top portion; we'll now be making the collar of the vest. 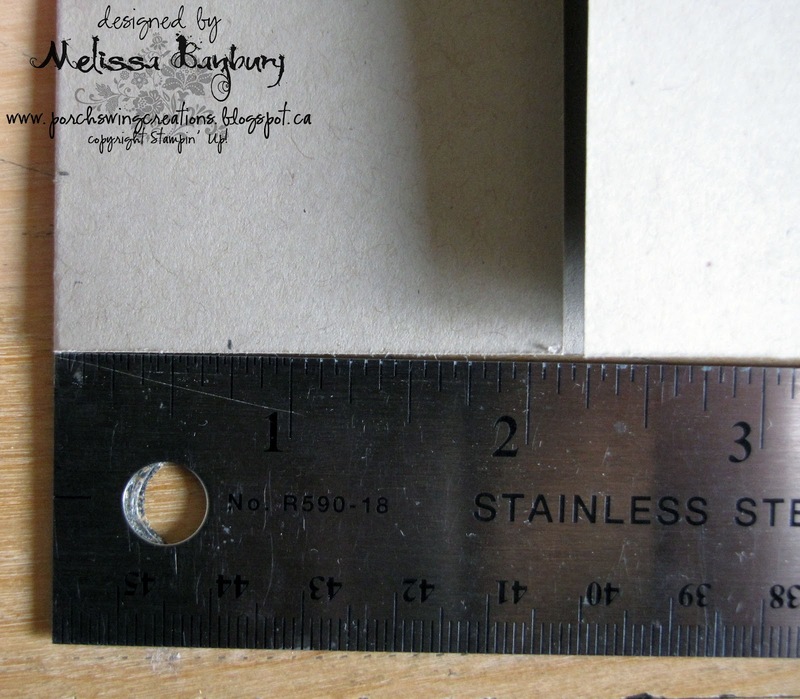 From the flaps measure 1" out on both sides. 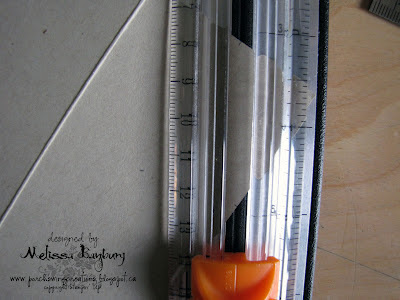 Measure 1 1/2" vertically from the top of the card down. 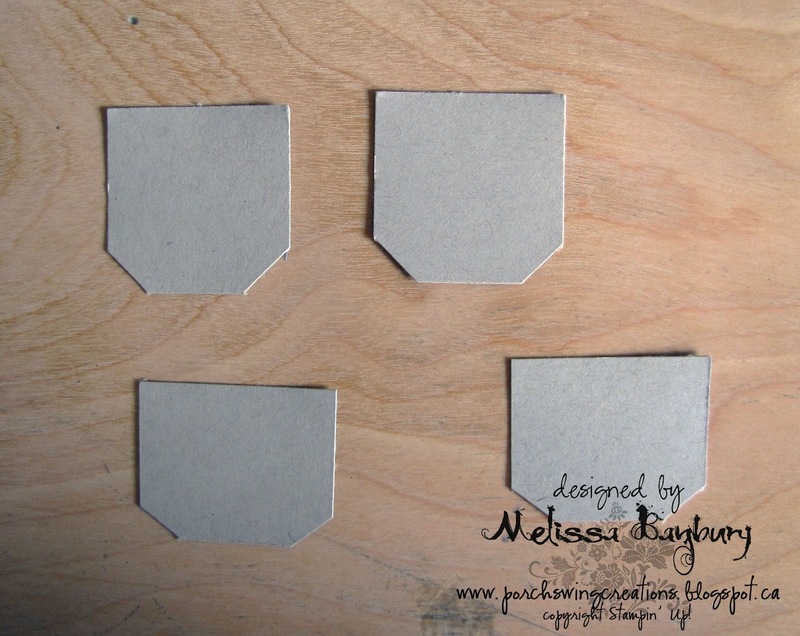 Open the card to cut on each flap individually. 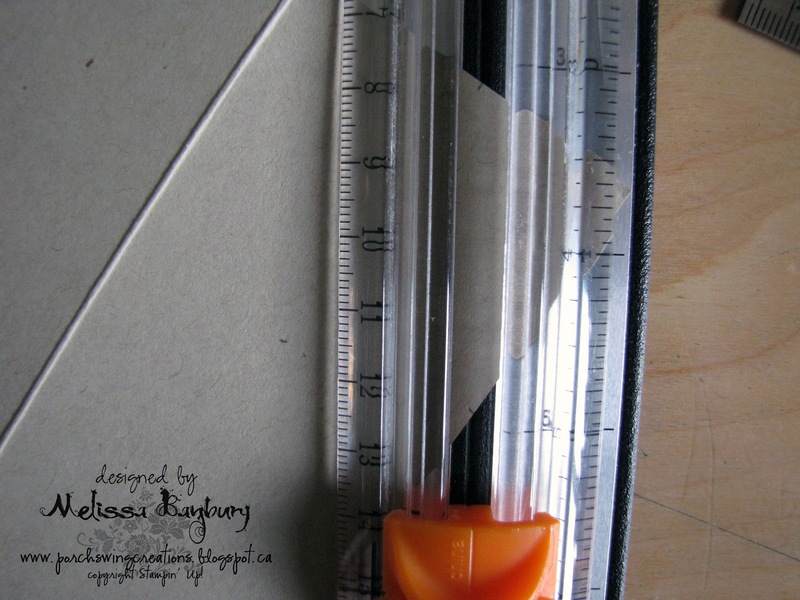 Line up the two measurements on the paper cutter and cut. Repeat on other side. 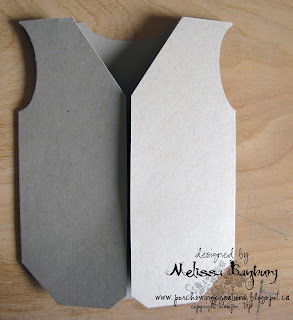 Create the armholes using a wide oval punch; cutting through both layers of cardstock. The back portion of the neckline was made with the wide oval punch as well. The bottom center "V" of the vest was made by only cutting through the top of the cardstock measuring in along the bottom 1/4" and vertically 1/4". Cut pockets from Crumb Cake cardstock. 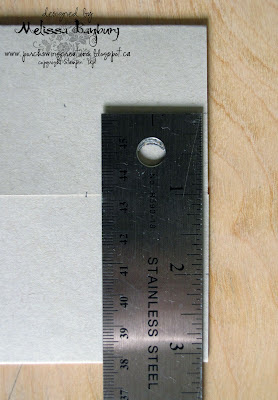 Two pockets were made with a 1 3/8" square punch, with the corners cut on an angle of 1/4". The other two pockets measure 1 1/2" x 1 1/4", with the corners cut on an angle of 1/4". Lightly sponge Early Espresso on top of the Soft Suede on vest and pockets. 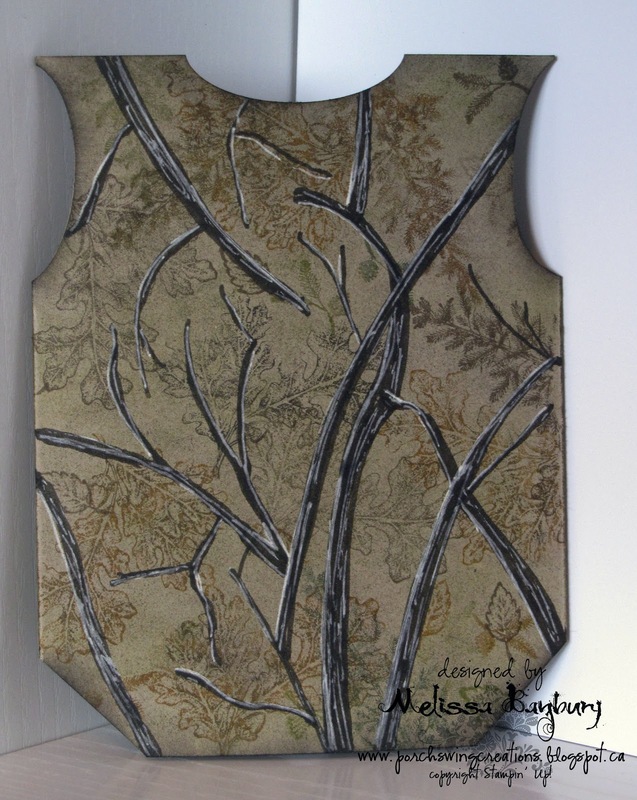 Lightly sponge over the previous colors with Old Olive. Using select stamps from the Lovely as a Tree stamp set randomly stamp images across the vest and pockets (not pictured). In this instance I used the oak leaves, the 2 small leaf stamps, and the upper portion of the evergreen tree. Stamp using More Mustard, Old Olive, and Early Espresso inks. Next using an Early Espresso marker, randomly draw branches on vest and pockets. 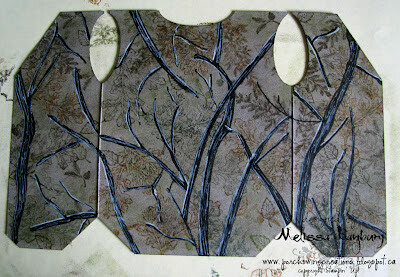 After drawing the branches, highlight with a white gel pen. 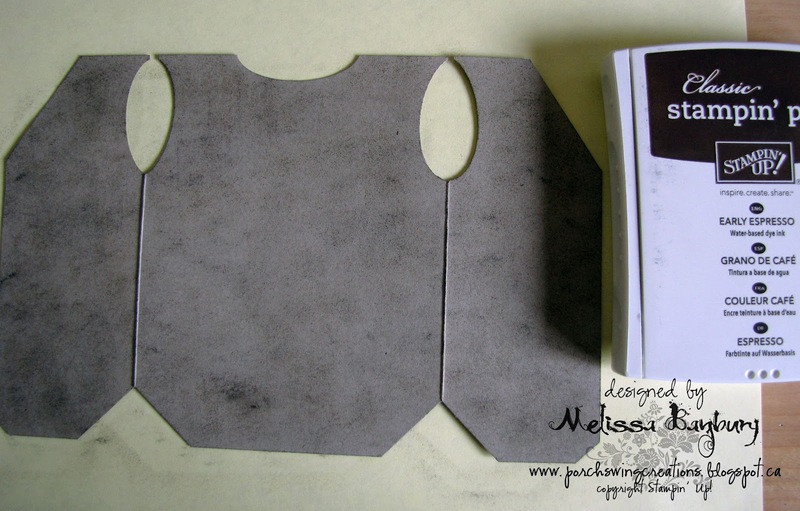 Cut pocket trim pieces, collar trim, and button flaps from Soft Suede cardstock. 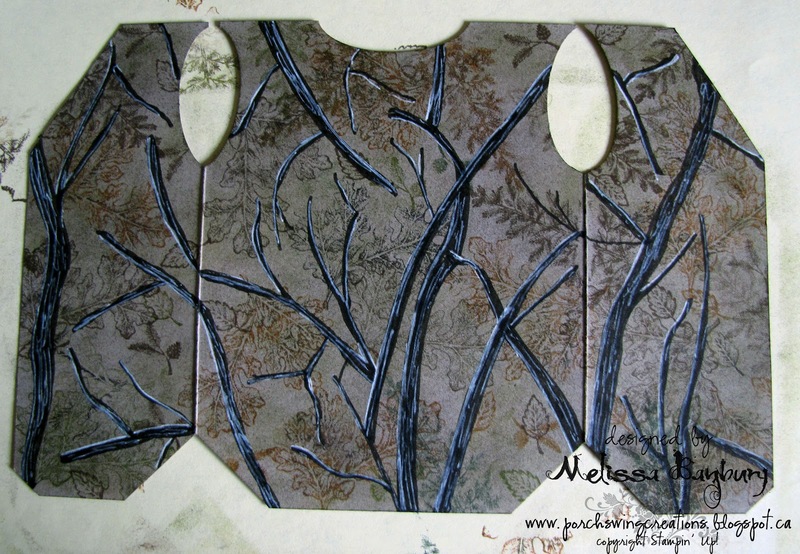 Pocket trim - 2 @ 3/8" x 1 3/8", 2 @ 3/8" x 1 1/2"
Button flaps - 1/4" x 3/4"
Assemble card. 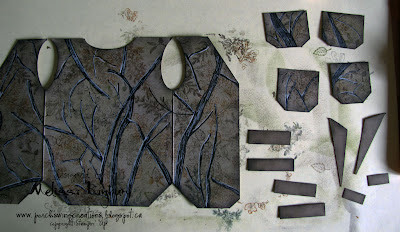 Pocket trim and collar were glued on with liquid glue (Tombow). 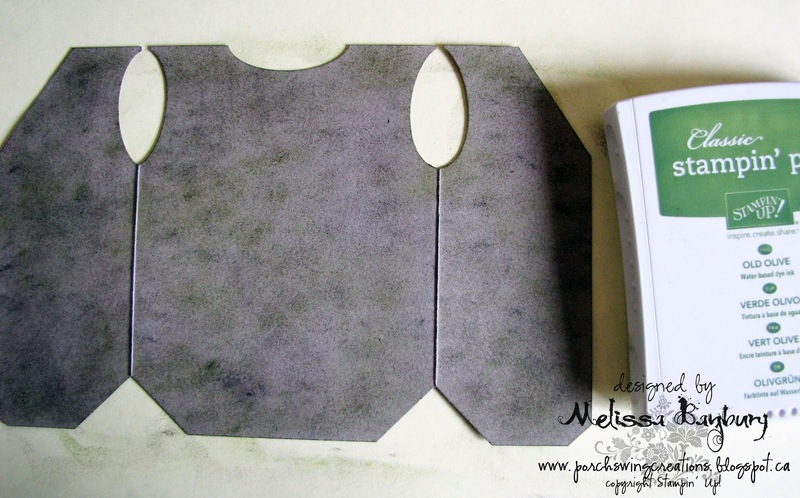 Pockets and button flaps were adhered with sticky strip. Two small metallic brads were added to the button flaps using a piercing tool. Faux stitching was added to the pockets with an Early Espresso marker. 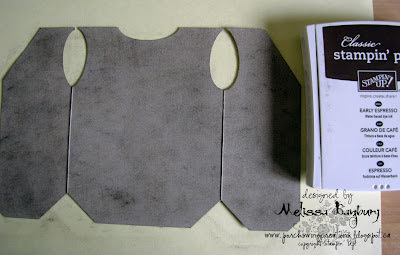 A small piece of Whisper White cardstock was added inside the card for the sentiment; to make it look like a t-shirt use a wide oval punch to create the neckline. Embellish with small fish hooks, adhering with stick strip. Safety Tip: I cut off the barbs with side cutters for safety before adhering the fish hooks to the card. Wow! 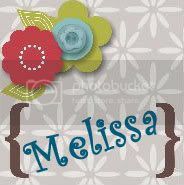 Melissa, this is incredible! Love it...TFS! This is amazing! Great job! I'm now following you. Love it, too ad I don't have any fishers/hunters in the family. Great job! wow! this is pretty amazing!Thank you for sharing! I'm your newest follower! Thanks for following me. Great work and Ty for the instructions! I am now a follower. Thanks so much for the great card and clear instructions. I look forward to creating this card! Wow, this card and tutorial is awesome. Thanks for sharing. Blessings!! 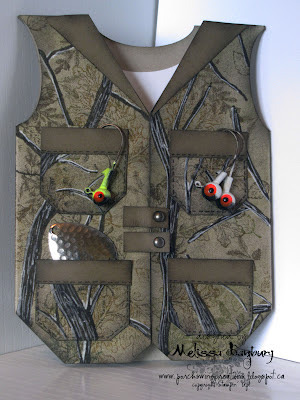 One of the best fishing jacket cards I've seen. 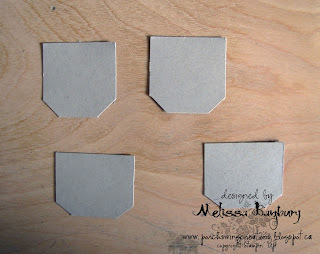 Thanks for the inspiration, also never though of using my punches to trim cards to shape. Excellent idea!! Very unique camo - awesome end product! 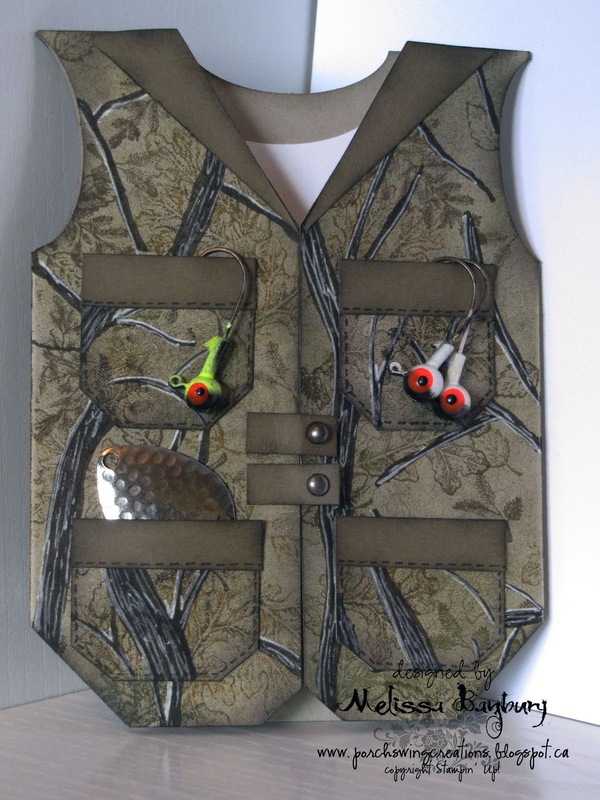 Awesome and special for any man who loves the outdoors - thanks for sharing the tutorial and great directions!! I'm starting to recognize your work elsewhere on the Internet! Saw this on Pinterest and knew I'd see it in my mail soon because I'm one of your followers. Can't wait to try this myself next time I'm in a gate fold state of mind. 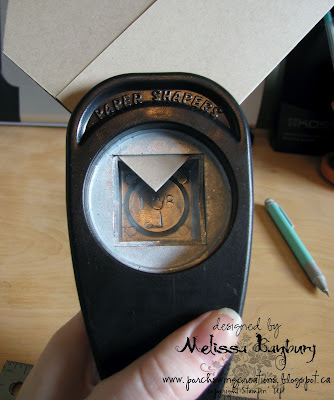 What a really clever use of this oldie but goodie stamp set! Have just written down all the instructions and headed to craft room to make this card for my grown son. Hopefully it will turn out half as good as yours. Wundervoll! Große Klasse! Die Weste ist super. das richtige für meinen Sohn zum Geburtstag. Er angelt immer sehr gern. Deine Anglerweste ist klasse geworden. Auch mein Sohn ist ein Angler und er hat sich riesig über die Geburtstagskarte gefreut. What an undertaking and imagination! Great job! I will have to give this a try. Thanks for sharing your inspiration!